Hi All, I have a question about my front forks. 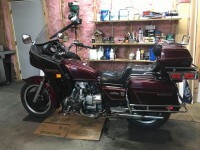 I wrecked my goldwing back in the spring of 17 and have been putting it back together or a limited budget ever since. My right front fork is busted and I came across this great deal, but it's a GL1100I Interstate fork set and it doesn't look like mine. I just wonder if it will work on my bike. Any comments would be helpful. Hi, thanks for the reply. My bike is a 82 GL1100, the forks I'm looking at are 83 Interstate. Where could I check the numbers on them ? Ok, I found out the interstate forks will not work on my bike because of the trac braking system. I only need the right fork which was damaged. I found one on Ebay, but other concerns are preventing me from purchasing it at this time. I have a fork tube off my 82 that you are welcome to. I don't have the lower slider. i'm in Morgantown. Hi, I'm not sure what you mean by the lower slider. Everything on my fork is okay except the part that holds the seals is damaged at the top. The insert is undamaged.